Price Tip: If you hate negotiating and still want the best possible deal, always price shop online first. We recommend Car Clearance Deals, MotorTrend, CarsDirect and Edmunds. These free services will offer you the lowest prices on a new Nissan and supply you with multiple competing price quotes. You will know the best price before you visit the dealer. Most people mistakenly believe that the Nissan Invoice Price reflects what the dealer paid for a new vehicle - The true Dealer Cost. It is not! Knowing the dealer cost of a new Nissan gives you needed leverage when it comes time to negotiate a great price. Negotiating from the cost up and not the MSRP down can save you thousands on your next purchase. If you are contemplating purchasing a new car you may encounter some of the following terms. MSRP. This stands for Manufacturer Suggested Retail Price, and as the name implies it is the manufacturer's recommended sale price for a vehicle. Each dealership can name their own price, but with theMSRP figure as a tool you can determine how fair a price quote may or may not be. Dealer Invoice Price- This is the price the dealership paid the manufacturer for a specific car. This is a great figure to have because you know exactly how far down a salesman can go before they get below cost. Dealer Holdback. This refers to money the manufacturers pay the dealers, which usually gets passed down the chain to the consumer. When a dealer buys inventory from a manufacturer they keep so many cars on the lot they have to take out loans to cover the expense of the large inventory. The Dealer Holdback is what the manufacturer pays the dealership to cover interest on their loans. Dealer Incentives. 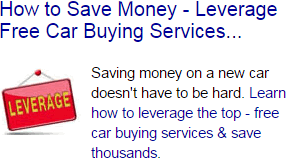 These are incentives offered by the dealer that encourage the sale of certain vehicls. These incentives can include cash Rebates or low financing rates. Regional Ad Fees. These are fees passed to the customer from the dealer to cover costs from advertising. They are itemized on your bill of sale, and because the dealer considers this as part of the vehicle's cost it is difficult to negotiate these fees down. Destination Fees. These are the charges the dealer passes on to the customer for transporting a vehicle from the factory to the dealership. Manufacturer Incentives and Rebates. Similar to Dealer Incentives, these are incentives or Rebates passed on by the manufacturer to the dealer designed to move certain models that may not be selling particularly well. Base Nissan Invoice Price + the dealer Invoice price of Options + Destination - Holdback = Total Dealer Cost.